Depression glass lidded sugar bowl ~ Made in USA ~ Hazel Atlas ?. Royal lace. I perfect condition, it stands 10.5 cm high plus the lid ~ approx 15 cm over all. A large 1930s Hazel Atlas royal lace pink glass pitcher or jug with straight sides and an ice lip. Authentic part-labelled Depression Era Hazel Atlas Royal Lace Large Cookie Sweet Storage Jar in Pink Glass. Bears part of its Hazel Atlas label with its base in great condition and not a scuffed one. Rare and sought-after Doric and Pansy pattern Depression Glass covered butter dish in aqua / ultramarine, manufactured by the Jeannette Glass Co, Pennsylvania in 1937-8. There are a couple of very small nibbles on the detail above the lower rim confined to the area shown in the second to last photo. TO TOP OF LID 7.5". A Beautiful Complete Dessert Set - Comprising 1 x Large Bowl 6 x Sherbet Dishes and Underplates. made with love by. Includes: 1x Jug, 6x Glass Saucer and 1x Bagley Butter Dish. Type: Uranium. Main Colour: Green. Everything included in the sale is photographed. Anything not photographed is not included. Hope I have the category right on this one. Depression glass colours but carnaval glass shape?. In immaculate condition and nice and weight. 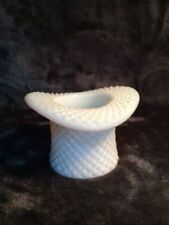 Crimped bowl with serrated edge. Amber colour. Jug is in really good condition for age. The Top rim of the jug is made up of 15 flat surfaces. 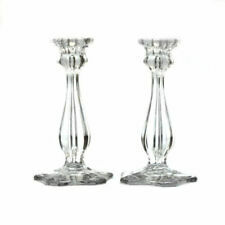 Beautiful depression glass pitcher and set of 6 x tumblers in the Royal Lace design. Made by the Hazel-Atlas glass company in West Virginia-America between 1934-1941 The pitcher has a hand worked ice lip The pitcher and tumblers are in perfect condition Delivery within the London area is possible for the cost of public transport to the destination. 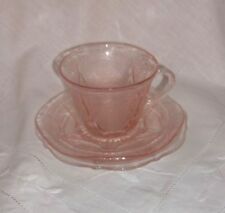 Art Deco Pink Glass 'Cherry Blossom' by Jeannette Glass,Pennsylvania, USA. They are a matching set of salmon pink thick glass plates featuring a built in floral panel design around the outer plate with a large cherry pattern in the centre with a shaped edge. EACH PIECE IN GOOD CONDITION. VERY COLLECTABLE. BLACK DEPRESSION GLASS. SMALL CHIP ON PLATE - DOES NOT REALLY AFFECT USE AND HARD TO SEE - NICE DETAIL ON BOTTOM - PRESSED DESIGN. WOULD BE GREAT FOR COLLECTORS - NORMALLY SEEN ON THE OTHER SIDE OF THE ATLANTIC ! Jeannette made Floral from 1931 to about 1934, with a few pieces of kitchenware produced in 1935. Floral is a mold etched pattern. Pink Depression Cut Glass Fluted Fruit Bowl. Rare design in the style of art deco. For fruit, sweets, nuts etc. Unusual handles in the shape of wings/ears. I am in the UK and seeking to sell this 30 piece set in the stunning and now rare ULTRAMARINE has including the much sort after BUTTER DOME which is in pristine condition. It’s a stunning set in which every piece is beautiful n mint condition (no cracks chips or nibbles) and comprises of the following: Tray Sugar Bowl Creamer/ Milk Jug Butter dome and faceted lid Four tea cups and six saucers Six small plates Five dinner plates Four small bowls Email any questions. Will post worldwide. Vintage Green Depression Glass, 4 Dessert Bowls. Condition is Used. Two bowls have small chips. Hazel Atlas Royal Lace Glass 1820’s USA. Condition is Used. Dispatched with Royal Mail 2nd Class. ONE STOPPER IS CLEAR GLASS THE OTHER BLUE WHICH DOES HAVE A SLIGHT CHIP ON IT (SEE PHOTO) OTHERWISE IN VERY GOOD CONDITION. WAVY RETRO BOTTLES THAT FIT TOGETHER THEY CAN FIT TOGETHER OR LOOK FABULOUS ON THEIR OWN. Square and curvy in shape with the frosted Madrid pattern very pretty. Unusual, durable, weighty. There are 4 of each - 6" side plates and 5" dessert bowls. The Madrid pattern in amber dates 1932-39. 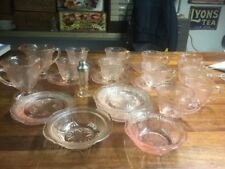 Art Deco Pink Depression Glass 3-Section Divided Serving Dish. Depth - to the point at the centre of the 3 dividing sections : 5.5cm. Good condition. See photographs. Approx H10.3cm x D9.8cm (rim) / W285g. The Royal Lace pattern was produced between 1934 - 1941. SMALLER BOWLS ARE 5" ACROSS - 6 OF THEM. 6.5" x 2" height. Hazel Atlas bowl/dish - production 1902-1956.